The United Kingdom has a most ambitious climate change mitigation plan as it is willing to cuts its emissions by 34 percent by 2020. This is further than the European Union which is willing to go as far as 30 percent. This week, Gordon Brown is due to unveil a £100 billion (110 billion euros or $170 billion) wind energy program for the next decade. This would lead to the implementation of 3,500 wind turbines providing up to 25 GW of capacity. Even if I would have prefered a plan of similar scope on energy efficiency I believe this is the beginning of a grand project that should inspire many of its neighbours. The government envisages a third of the UK’s energy coming from wind power by 2020. The plan is far and away the most ambitious in the world and comprises the central plank of the country’s efforts to cut emissions. 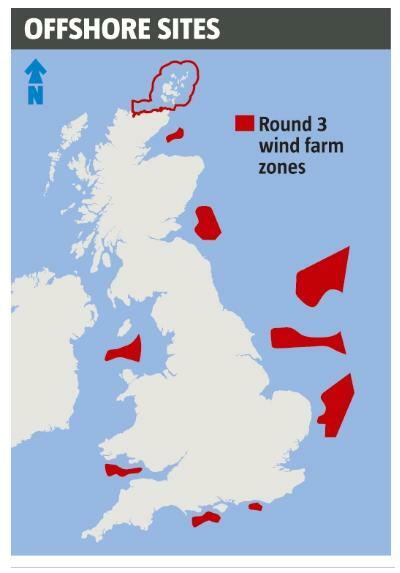 It revolves round the construction of nine enormous offshore wind farms on parcels put up for auction by the Crown Estate, owner of the UK’s territorial seabed. The sites will cost more than £100 billion to develop. The prime minister is expected to use the announcement of the winners, to be made at an event in Exeter, to highlight the employment and economic benefits of the programme. The British Wind Energy Association (BWEA) estimates it will create up to 60,000 jobs. Britain is developing its resources while America is still lagging behind. Why can’t this be done in America? So may green jobs can be created. Thanks Adrian for your comment. I agree, other nations should follow Britain’s example and get moving on green jobs. There is so much to do to prepare the post-oil society.